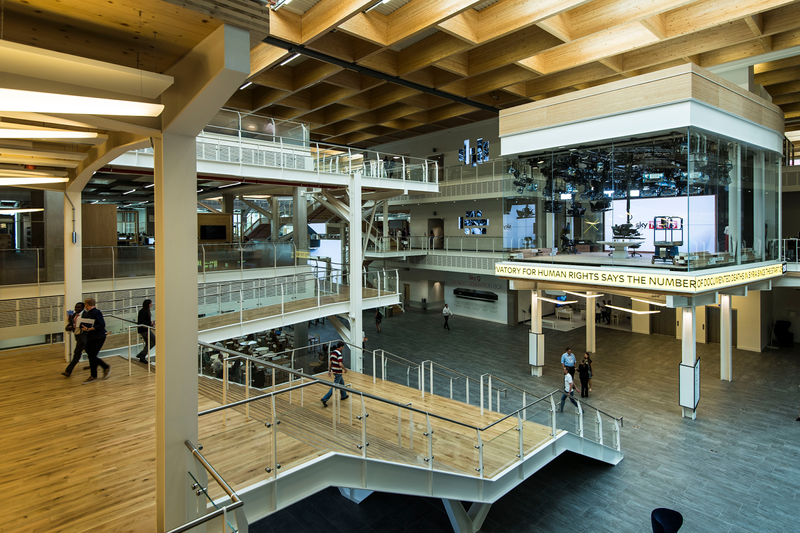 Sky News is to launch a refreshed schedule to mark its move to new studios at Sky's HQ in Osterley. The first changes to the schedule will start on 26th September, with the schedule changes due to be complete by the end of October. Following the recent announcement of Eamonn Holmes' departure from Sunrise, Sarah Jane-Mee and Jonathan Samuels will present an extended show from within their new glass studio (pictured above), running until 10am. Adam Boulton takes over at 10am with a daily politics show - All Out Politics - with the latest Brexit developments. Colin Brazier and Jayne Secker will bring the latest lunchtime news from 11am to 3pm. Kay Burley will move to a new timeslot, incorporating the channel's previous "Live at 5" slot, keeping viewers up to date with the latest developments from 3pm to 6:30pm. She will continue to host the Sky Debate that will focus on the most pertinent stories of the day. Sarah Hewson will take on the afternoon show on Fridays, as well as hosting across the schedule during major stories when presenters are on location or away. From 6.30pm to 7pm Ian King will continue to present Ian King Tonight helping to shed light on the implications of the big business stories of the day, as well as offering incisive interviews with business leaders and analysts. A new evening line-up commences at 7pm, with Dermot Murnaghan taking over the helm at Sky News Tonight, presenting a two hour evening programme from Sky’s Westminster studio. The show will include rigorous interviews and showcase Sky’s specialist reporting team including exclusive reports and in depth analysis. Anna Botting will remain the lead presenter on the evening programme from 9pm until midnight. She will continue to take a look at the next day’s papers with a range of guests, giving viewers a preview of tomorrow’s leading stories. The Sky News weekend schedule has also been re-launched with new shows for Gillian Joseph, Niall Paterson and Sophy Ridge. Stephen Dixon will be joined by new co-host Isabel Webster on Sunrise from 6am until 10am on Fridays, Saturdays and Sundays. Niall Paterson will host from 10am until 2pm on Saturday, and 2pm until 5pm on Sunday. Sophy Ridge will become a permanent presenter with a 2pm to 5pm show on Saturday and a noon until 2pm show on Sunday. She will also host Sky News Tonight on Fridays in place of Dermot Murnaghan. Gillian Joseph will host a new programme on both Saturday and Sunday afternoons from 5pm until 8pm. Dermot Murnaghan will carry on presenting his Sunday morning show, Murnaghan, and Anna Jones will continue as anchor for Sky News in the evenings from 8pm until midnight Friday through to Sunday. Kimberley Leonard will also remain hosting Sky News from midnight until 6am bringing viewers news from around the world. The schedule changes follow a number of high profile departures from the channel, including Andrew Wilson, Lorna Dunkley, Samantha Simmonds and Jeremy Thompson. New weekday schedule to be fully in place by the end of October. Sarah Jane-Mee takes over from Eamonn Holmes on Sunrise from 17th October.